Twitter is an online social networking/media site that allows users to send and read short (i.e., 140 characters) messages called "tweets" in real time. Its popularity as a fast information dissemination platform has led to applications in various domains (e.g., business, disaster recovery, intelligent transportation, smart cities, military scenarios, etc.). Users on Twitter are generating about half billion tweets everyday. Some of these tweets are available to researchers and developers through Twitter's public APIs. In this assignment, you will learn how to collect different types of data from Twitter by using an open source library called Tweepy and build your own Twitter data crawler. Since Twitter has an IP based rate limit policy, please use your own computer to finish this assignment. If you have a problem in finding a machine to finish the assignment, please contact the instructor. Build a crawler that collects a user's profile information from Twitter given the user's Twitter ID. Build a crawler that collects a user's social network information given the user's ID. Build a crawler that collects the tweets using a set of specified keywords and a geolocation based criteria. Open Authentication (OAuth) is an open standard for authentication that is adopted by Twitter to provide access to the protected information. OAuth provides a safer alternative to traditional authentication approaches using a three-way handshake. The authentication of API requests on Twitter is done through OAuth. Note that Twitter APIs can only be accessed by registered applications (e.g., the crawlers you will develop in this assignment). In order to register your application, you first need to have a Twitter account. If you already have one, you can just use it. If not, you can go ahead and sign up one at Twitter. After that, you need to bind your Twitter account with the application you registered (i.e., crawlers). Once you finish the binding process, you will get the keys and tokens (i.e., a pair of consumer key and consumer secret and a pair of access token and access token secret) for your application. Go to https://dev.twitter.com/apps/new and register a new application to Twitter for this assignment. You can pick a name at your choice for the application. For Website URL, you can either use your own homepage or simply type http://IP address of your machine. Fill in all required fields, accept the Developer Agreement, solve the CAPTCHA and submit the form. Obtain the consumer key (API key) and consumer secret from the screen and use them in your application (i.e., crawlers). In the webpage of your application, click the Keys and Access Tokens tab, then scroll down and click Create my access token. In the webpage of your application, click the Permissions tab and configure your application with the permission level you need (namely, read-write-with-direct messages). Obtain the indicated access token and access token secret from the screen and use them in your application. Python is a great programming language for fast text data processing. Active developer communities create many useful libraries that extend the language for various applications. One of those libraries is Tweepy. It is open-sourced and hosted on Github. Tweepy provides an easy way for your python code to talk to Twitter through its APIs. To get a quick start, please read the Tweepy Documentation and its Github Repository. For more information about Tweepy, you can visit www.tweepy.org. * If you use other versions of Python, please make sure your code run correctly and specify the version number of your Python in the README file you turn in. Either way gives you the latest version of Tweepy. Users create profiles to describe themselves on Twitter. Such profile provides a rich source of information to study the Twitter users. The following is a snapshot of a user's profile information (the user ID is 13334762). 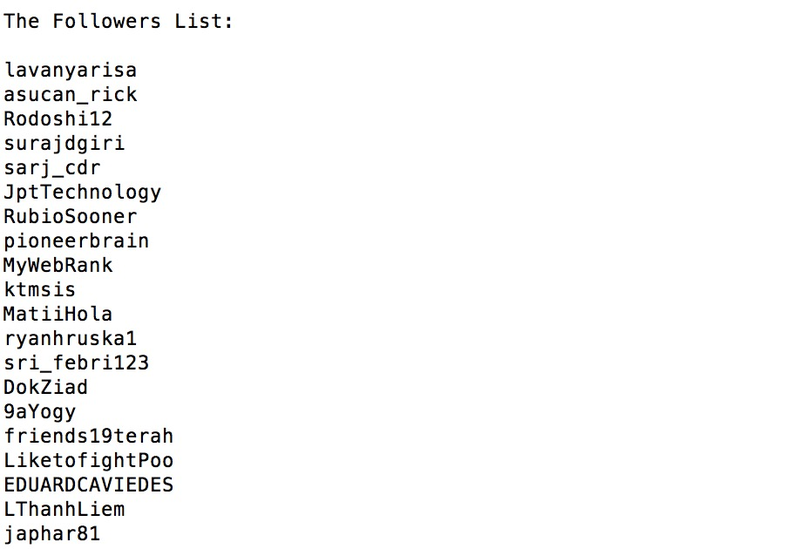 Given a list of user's IDs, please write a data crawler to collect the users' profile information. (1) A result file that contains the profile information of the Twitter users with the following IDs: 34373370, 26257166, 12579252. (2) The source code of your crawler to finish this task. A user's social network on Twitter is a directed network. There are two types of connections between users: follower and friend. 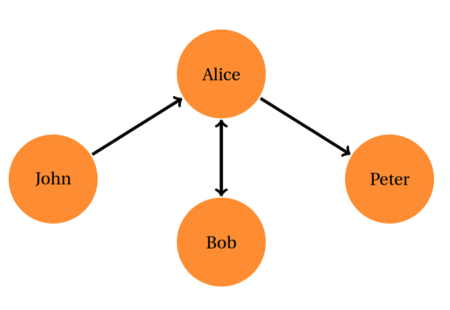 In the following figure, John follows Alice, therefore John is Alice's follower. Alice follows Peter, and Peter is a friend of Alice. The following is a snapshot of a user's social network information on Twitter (the user ID is 13334762). (1) A result file that contains the social network information of the Twitter users with the following IDs: 34373370, 26257166, 12579252. 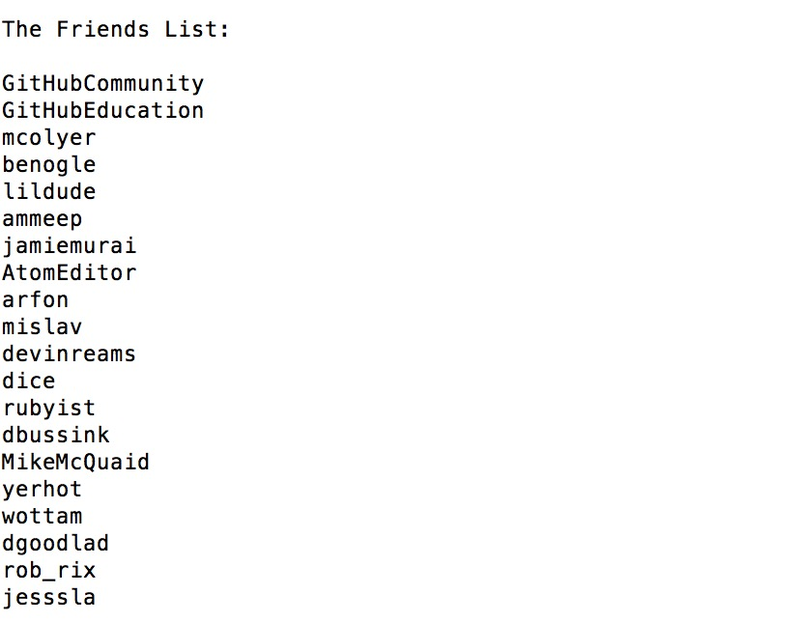 Note: you only need to collect the first 20 followers and friends of a specified user in the result file. Searching on Twitter is facilitated through the use of search parameters. Acceptable search parameters on Twitter include keywords and geographic regions. Hint: Twitter has two different APIs for applications to collect tweets: search API and streaming API. For this assignment, you might want to look at both and decide which one to use. (2) collect tweets that originate from the geographic region around South Bend: [-86.33,41.63,-86.20,41.74]. Note the coordinates corresponding to two diagonal points of a rectangle: Longitude of left point, Latitude of left point, Longitude of right point, Latitude of right point. (Note that Google Map normally takes a slightly different format as [latitude, longitude]). (1) A result file of tweets that contain one of above two keywords (50 tweets will be enough and the result file size should be less than 1 M). (2) A result file of tweets that originate from the specified geographic region (50 tweets will be enough and the result file size should be less than 1 M). (3) The source code of your crawler to finish this task. For the above three tasks, you can either submit a single script file that finishes all three tasks altogether or three individual script files that finish task 1-3 respectively. Please submit a README file and describe in this file: 1) how to run your source code; 2) the Python version you used to test your code. This assignment is due at the beginning of class on Tuesday, February 3rd.